You probably know the feeling. The sheets or the jeans you need dry are not quite there yet. You either have to give in to damp fabric or give it another round in the dryer. If only it did its job properly. There may be many reasons behind your dryer’s inadequacy, but a common culprit is the vent. Here are the three issues you will most likely face with your dryer vent. Excessive lint in the dryer is not just annoying, it may also be a fire hazard. If lint is allowed to build up in the vent, the hot air may not be able to escape properly. This makes the dryer less effective and could cause much bigger problems if left unattended. To alleviate this issue, clean out your vent regularly, and have it professionally cleaned every once in a while. This problem starts right when a new vent is installed. If done by a person who doesn’t have the proper knowledge, the vent may be loose or otherwise not fitted properly. If this is the case, the dryer will still do what it’s supposed to - but other problems will occur more often. It’s advisable to ensure that the vent is installed correctly in order to avoid any future problems. This problem relates to the dryer system as a whole, and thus also encompasses the vent. If the dryer itself or the air duct attached to it are not properly taken care of, they may affect its performance and may cause damage to the vent. In this case multiple factors affect each other and will likely require professional attention. Lint accumulation, improper installation, and poor maintenance are the most common issues that will affect your dryer vent. They can largely be avoided by taking care when cleaning and installing the vent and related parts, but if they do evolve into more serious problems, our experts are ready to take on the task. 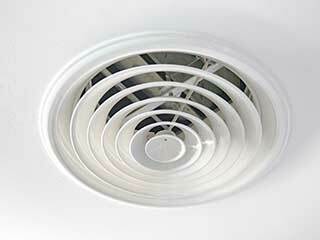 We handle all cleaning, repair, and replacement related to air ducts and vents, including dryer vents.